Home Latest News Any sign of May changing course? Second time very unlucky. The tweaks to the deal with the EU that the prime minister sweated for more than a month to achieve were to little purpose. The government was, again, comprehensively defeated, this time by almost 150 votes. One senior cabinet minister said this afternoon another thumping defeat would mean that she “has to change course”. So far, she has shown no sign of that, repeating, as we have heard her say so very many times at the despatch box, that she believes her deal is still the best one. But neither did she move away from the promises she has made more recently, to give MPs a vote on whether they want to stop us leaving without a formal deal at the end of this month. Get the top keywords for EVERY category on Amazon and use Commission Sumo to upload and have 1,000's of targeted keywords on your blog immediately. There is already consternation in the Commons over her additional pledge that leaving without a deal remains the default option. The vote will, though, after pressure from colleagues, be a free vote where Tories can vote as they wish. That might not sound like a big deal, but for the government to let its own troops vote as they like on an issue that’s so important is extremely unusual. And if, as is likely, they rule out leaving with no deal for now, on Thursday she confirmed another vote for delaying Brexit. What isn’t clear from all of that is how the prime minister actually intends to dig herself out of this dreadful political hole. The response of the 27 other EU countries to any request for an extension would be influential too. But that’s an argument for another day, and there are likely to be many, for sure. You might wonder how has Theresa May found herself in this position again? When she hailed a revised deal last night in Strasbourg then crashed to defeat again. Her rivals and friends would give a long list of reasons. Her own difficulties in deploying the authority of Number 10, to charm and promise, to chivvy reluctant backbenchers, are well known. The grumpy dynamics and misunderstandings with the EU have played a part too. Decades of disputes over Europe inside the Tory Party are at the root – and part of today’s problem. 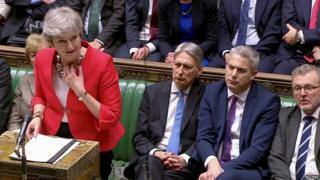 But above all, Theresa May as prime minister has been trying to achieve what would have been distinctly challenging for any leader to pull off at any time – to complete a grand project, abhorred by many, adored by others – to persuade Parliament to unplug the UK from the European Union without a majority in Parliament. Her decision to gamble with a small majority in 2017 haunts her profoundly still.